WHAT’S UP IN THE CLASSROOM? WHATSAPP! Over the last decade, research into second language learning and teaching has focused increasingly on the use of technology in the classroom. The interactive features of multi-media can entice teachers to explore novel ways to engage students more creatively. In this sense, the technological device that is closest to learners is the cell phone. Most language teachers agree on the advantages of implementing mobile learning in their classes. However, many of them complain that what they need is not to be told about the benefits of its inclusion, but practical ways of doing so. Although there are many useful applications that help teachers include cell phones in their classes, not all of them would completely fit our Argentinean context. The simplest, and most widely spread application among students nowadays is Whatsapp, and it’s free! We decided to present the workshop “What is up in the classroom? 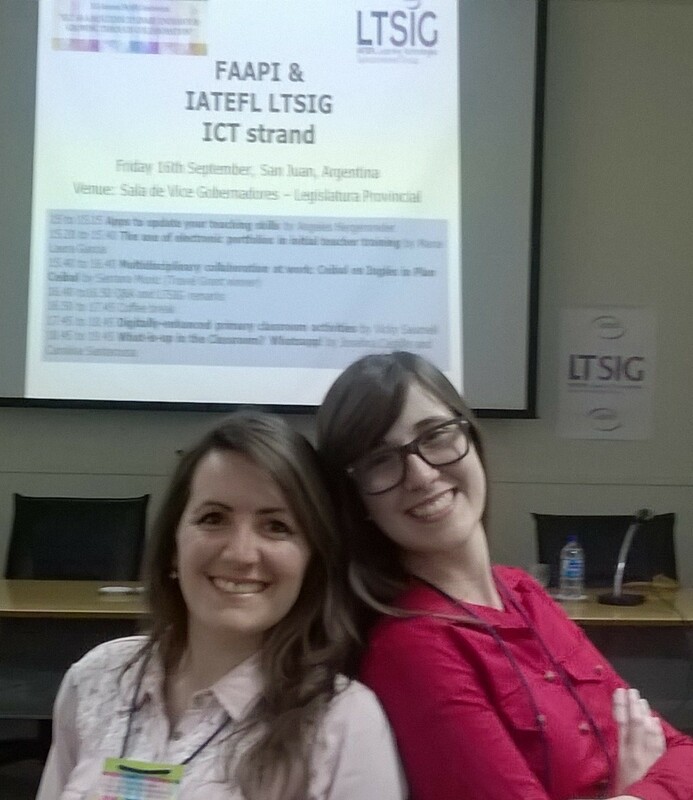 Whatsapp!” at FAAPI 2016 so as to give teachers ideas and insights that worked in our language classrooms, providing specific activities for the development of all the skills. Our Theoretical Basis – or lack thereof? As mentioned above, the content of this article was to be presented at FAAPI 2016, so we thought that our first task was to look for similar ideas coming from names of greater importance, so as to provide some kind of theoretical background to our practices. The reality was, however, that we had started applying this method of working long before we even considered FAAPI 2016. When we finally started our research, we found that there was, in fact, not much theory that dealt specifically with Whatsapp. 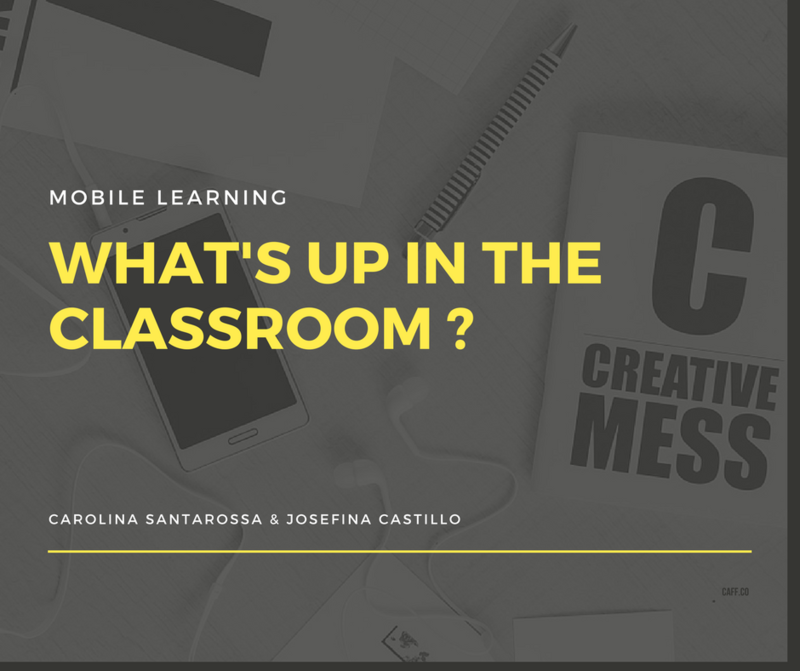 Surely, there was plenty about mobile learning, blended learning and the use of technology, but there was little research as specific as our topic. We did come across the findings provided by Dan Bouhnik and Mor Deshen, who carried out research concerned with the social and academic advantages of different types of social media – including Whatsapp. They concluded that, in these respects, Whatsapp was the most integrative of all, mainly because of its multiplicity of options, simplicity, accessibility and efficiency. They were succinctly expressing what we had thought all along. That’s exactly what we had set out to demonstrate in our classroom practice. The first essential step to take into account is establishing the guidelines. We went over all our rules with the students, so that they knew exactly what was expected from them. 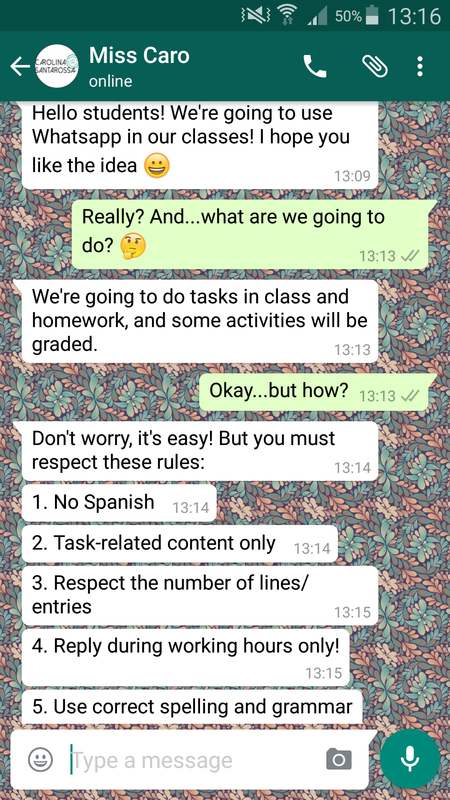 In a similar way to how classroom rules are introduced the first day of class, the way in which you present the Whatsapp project to your students is going to set the pace for the rest of the activities. It is vital that students are aware of both what they are supposed to do, and how they are going to be assessed. As regards this last point, it is also important that you are clear on the rubrics that are going to be taken into account to correct students’ productions – and if and when they are going to be graded. It is also advisable to ask parents for their permission to use Whatsapp in the classroom (in the case of younger learners), or to let them know that some assignments were going to be carried out using this app (in the case of older learners). The following screenshots were given to our students in printed format in order to introduce our project rules and assessment criteria. Needless to say, such rules and criteria have to be designed in such a way that they match your own classroom reality. The next step, as expected, was creating the Whatsapp groups. At the beginning, we created one group for each class, in which all the students from said class were included, and we performed a “trial” activity for students to fully understand how the process would work. Then, we considered it was sometimes necessary to create groups of 4 or 5 students (we were included in all the groups although we didn’t participate in all the chats). Creating smaller groups facilitated our follow-up work, fostered more personal assessment and improved the integration of all the learners since we kept on changing the members of the groups for each of the tasks. This methodology was also useful when some students didn’t have their phones with them – or simply didn’t have a cell phone at all – since it allowed for them to work in pairs or trios and send their answers to the smaller groups. Taking into account the context and characteristics of each group, we implemented the Whatsapp activities in different ways: as compulsory assignments to practice topics dealt with in class, as homework, as extra activities for fast learners (with the benefit of having them in silence), as entertaining and relaxing activities at the end of the class or as rewards for good behavior. What is important to highlight is that the first message for each specific activity must be clearly organized, since that was the chat initiation point and the instructions needed to be fully understood by all the students. Screenshot 3: example of activity. Developing reading skills is one of the easiest tasks on Whatsapp since we can provide plenty of activities to improve reading comprehension by simply having a text on our mobile phones. However, we should bear in mind that the texts must be short as students may not have big screens to be able to read comfortably. The idea of practicing reading comprehension through Whatsapp is not to replace the extensive reading done in the classroom. These short texts are meant to reinforce the skills they have already learnt in class, and to provide real life material – such as jokes, short articles on trendy topics, pieces of ad, etc. One major advantage of these tasks is that they can be done anytime, anywhere: at home as homework, or in the classroom for fast finishers – and it helps keep them quiet! 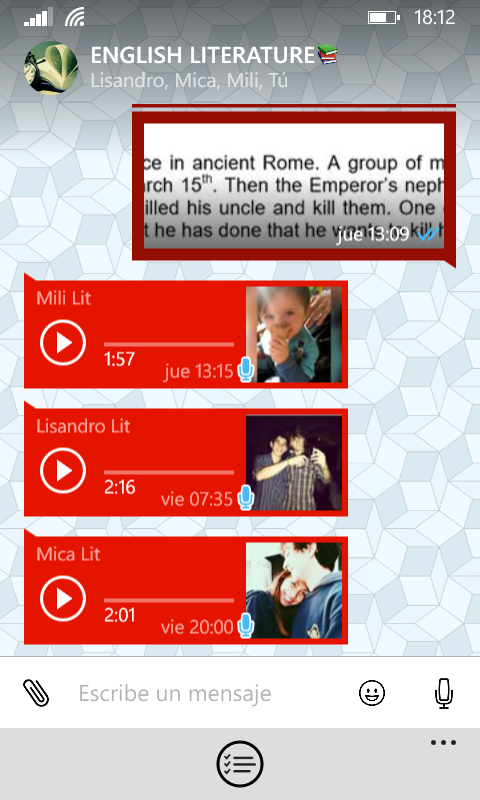 Writing is another useful skill we can easily make students practice via Whatsapp… and it’s more fun! Just remember that the assigned writings should be shorter than the assignments on paper format. We suggest that this type of activity be used to foster purely communicative and informal writing. 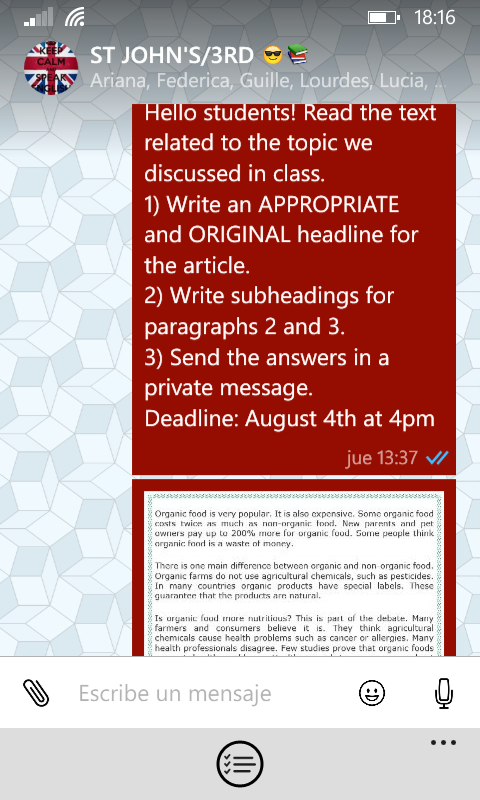 Students feel really motivated doing these tasks since it’s something they usually do: they use Whatsapp to communicate on a variety of topics via written language. 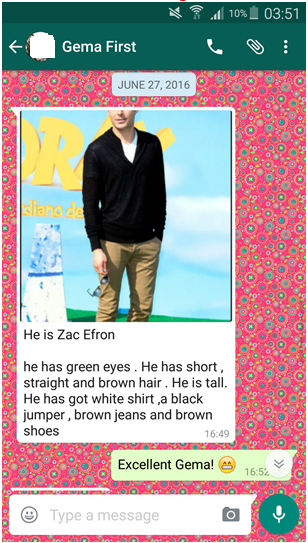 These activities can be adapted to fit even the lowest levels, as shown in the beginners’ activity portrayed in Screenshot 4, in which students uploaded pictures and made comments on them. This skill is probably one of the hardest to practice in the language classroom, mainly due to lack of equipment, background noise in the case of large classrooms and time constraints. Whenever these obstacles fail to appear and the listening activity goes fine, we always have that one student who finishes first and “spoils” the answers for the rest. It is common knowledge among teachers that most students find listening comprehension difficult. For these reasons, we consider Whatsapp a useful tool to give all students the opportunity to do the task at their own pace. We recommend doing these exercises as homework, when they can get the most out of the activity. However, it can also be done in the classroom, as long as they have their own earphones. Oral practice in the classroom is another complicated issue. More often than not, language classrooms are large in numbers, have little class time and many topics to cover. This is when Whatsapp becomes really handy. Just by sending an audio message, students can complete a task. It offers teachers the opportunity to check on pronunciation and fluency, and it gives pupils the chance to be assessed personally. Furthermore, these audio files may become records of students’ progress. Screenshot 5 shows an example of a speaking activity by a group of Literature students who had to explain the plots of different plays by Shakespeare. 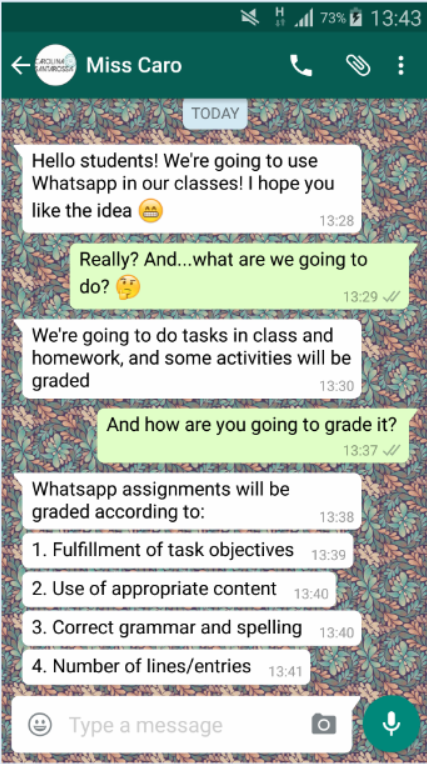 Once our project was in motion, we noticed that most students were enthusiastic about using Whatsapp in class and got involved in the activities. The tasks became more significant to them and those students who did not like speaking in class found a way of expressing themselves by means of a message or even an audio file. It amazed us how an app as simple and everyday life as Whatsapp could change so much our classroom reality and bring some of the outside, real world into our classes. But actually, the final message we would like to give all those teachers out there who might be reading us right now is to try. Simply that, try. It’s not as complicated as it seems, and we promise it’s worth it. Carolina Santarossa is a University Teacher of English and a Spanish-English Sworn Translator (Universidad Nacional de Cuyo). She experienced teaching English at a school in the USA during 5 months and she has worked with adolescents and adults for 9 years. Josefina Castillo is a University Teacher of English (Universidad Nacional de San Juan). She was student assistant and in charge of the Color guard of said University, and graduated with Honors. She is currently working in both private and public institutions. Forget notebooks! Improve students’ vocabulary through the use of mobile technology. © 2019 LTSIG. All Rights Reserved.